Heiligenkreuz Abbey (Stift Heiligenkreuz, Closter Heiligen Creyz or Santa Crux) is a Cistercian monastery in the southern part of the Wienerwald, eight miles north-west of Baden bei Wien in Lower Austria. It has existed without interruption since its foundation in 1133, and is thus the second-oldest extant Cistercian monastery in the world. It was founded in 1133 by margrave Leopold III of Austria of the house of Babenberg, also known as Saint Leopold, at the request of his son Otto, abbot of the Cistercian monastery of Morimond in Burgundy and afterwards Bishop of Freising. Its first twelve monks with their abbot, Gottschalk, also came from Morimond at the request of Leopold III. The date of consecration was 11 September 1133. They started by clearing the wood and tilling the land. They introduced the Christian faith into the region. They called their abbey Heiligenkreuz (Holy Cross) as a sign of their devotion to the redeeming effects of the redemption by the Cross. On 31 May 1188 Leopold V of Austria presented the abbey with a relic of the True Cross, which is still to be seen and being kept in the tabernacle of the main altar. This relic was a present by Baldwin IV of Jerusalem, King of Jerusalem to duke Leopiold V in 1182. Heiligenkreuz was richly endowed by the founder's family, the dukes of Babenberg, and was active in the foundation of many daughter-houses. Neuberg in Styria in 1327 (dissolved in 1785). More recently, in 1988, Heiligenkreuz founded Stiepel Priory at Bochum-Stiepel in the Ruhrgebiet. Furthermore in the 1990's the monastery gave substantial support for re-founding Hohenfurth (Vyšší Brod) in Bohemia. During the 15th and 16th centuries however the abbey was often endangered by epidemics, floods, and fires, and it suffered severely during the Turkish wars of 1529 and 1683. In the latter, the Turkish hordes burnt down much of the abbey precinct, which was rebuilt on a larger scale in the Baroque style under Abbot Klemens Schäfer. Heiligenkreuz abbots were often noted for their piety and learning. In 1734 the Abbey of St. Gotthard in Hungary was ceded to Heiligenkreuz by Emperor Charles VI, but was taken away again and united with the Hungarian Zirc Abbey in 1778. 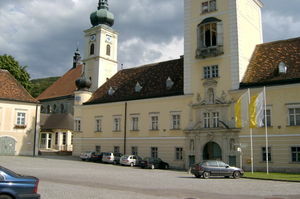 In its place the monastery of Neukloster at Wiener-Neustadt was joined to Heiligenkreuz in 1880. Heiligenkreuz was spared dissolution under Emperor Joseph II. The abbey was also an important Austrian centre for music for more than 800 years. Many manuscripts have been found at this monastery, most notably those of Alberich Mazak (1609–1661). In 1802 an institute for philosophical and theological studies was established, which became a Hochschule in 1976. It is now one of the largest establishments for the education of priests in the German-speaking world. Presently there are over 70 monks in the monastic community, the focus of which is the liturgy and Gregorian chant in Latin. Some of the monks also have pastoral duties in the 17 parishes for which the abbey is responsible or serve as professors at the Philosophisch-Theologische Hochschule. Others serve in caring for the upkeep of the historic abbey. Heiligenkreuz is also home to the Collegium Rudolphinum, a seminary for young men in preparation for the priesthood. Stift Heiligenkreuz is nowadays one of the most vibrant monasteries in central Europe; its abbot is the President of the Austrian Cistercian Congregation; one of the monks is the Procurator General of the Order, working in Rome. 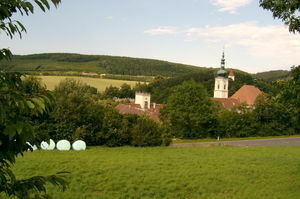 Many other monasteries send their junior monks to Heiligenkreuz for theological and monastic training. One enters the abbey via a large innercourt with, in its middle, a Baroque column depicting the Virgin Mary's Assumption into heaven; it was designed by Giovanni Giuliani and completed in 1739. The façade, as in most Cistercian churches, shows three simple windows as a symbol for the Trinity. Typically Cistercian, the church originally lacked a bell-tower. Such a tower was added during the Baroque era, it stands on the north side of the church, about at the middle of its length. 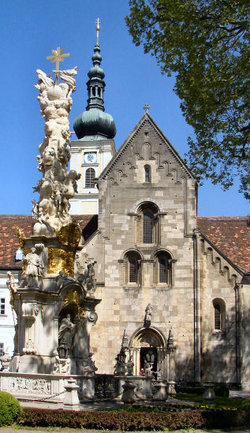 The church of Heiligenkreuz combines two styles of architecture. The façade, naves and the transept (dedicated 1187) are Romanesque, while the choir (13th century) is Gothic. The austere nave is a rare, and famous, example of romanesque architecture in Austria. The 13th century window paintings in the choir are some of the most beautiful remnants of medieval art. The Chapter Hall in the cloisters contains the graves of thirteen members of the House of Babenberg, including Duke Frederick the Quarrelsome, the last Babenberger. The remains of Blessed Otto of Freising are in a small chapel at the south side of the Crossing.